Current economic sentiment is negative, and the recession predictions are rampant. According to Recovery-or Recession? (Bloomberg Businessweek, July 23-29 2012), jobs are down, growth forecasts are being reduced, and manufacturing has declined. These outcomes are already reflected in the stock market. Some of the researchers, noted in Bloomberg, believe our economy is already in a recession. Considering the economic slump with all the possible outcomes, there is still a bright spot for our economic future- housing. Bloomberg states the “S&P/Case-Shiller Home Price Index showed that average home prices rose 1.3 percent in April, ending seven consecutive months of declines”. In my opinion, smart money has moved away from the stock market. More recently, the Federal Housing Finance Agency reported home prices rising 0.8 percent in May on a seasonally adjusted basis, and rising 0.7 percent in April. 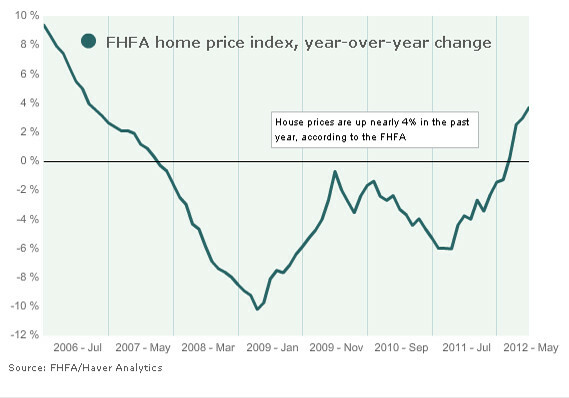 Overall, from May 2011 to May 2012, housing is up 3.7 percent (FHFA). Even Zillow reported that home prices have increased year-over-year for the first time since 2007 (Marketwatch.com). So I’m positive on housing because prices are down, interest is extremely low, and I know investors are making cash deals. Housing will not stay down, though, especially is Southern California. Looks at the trends… comment and you know how to reach me.